This photo was taken at the front door of the new school university central, at 5 o’clock in the morning. 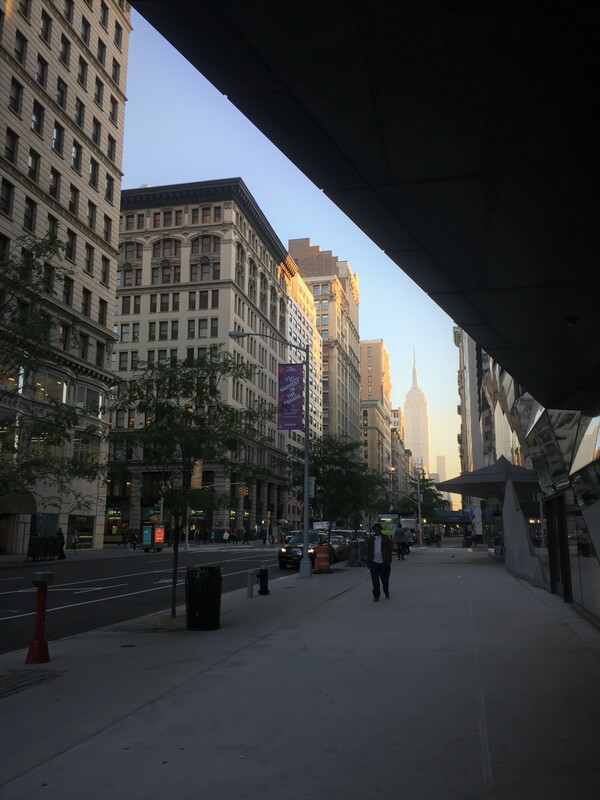 This photo shows a slowly awakening of Manhattan, With the sunrise, the sun gradually spread on the fifth avenue between the buildings, the sky and the ground formed a strong contrast. The street at the front of the screen is not completely illuminated, the scene seemed calm and serene, the upper side of the buildings is gradually getting the sunshine, walls and windows are illuminated into gold, seem to have vitality and energy. Distant Empire State Building in the focus position of the picture, its presence makes the picture shows a sense of power, so the picture will not be too calm, just can reflect the New York in the morning is being gradually awakened.